It’s good to see Swingball is still going strong, and indeed is supposed to be one of the most popular toys of the last 10 years. Whilst the image illustrating this post is of the current day Swingball, it hasn’t really changed a lot over the years, which is not surprising given its simplicity. The Swingball tennis game (also known as Totem Tennis) was all the rage in the 1980’s and allowed you to play a game of tennis in your back garden without needing to accomodate an entire tennis court, which would be beyond the rather less generous allotment of land that most people would probably have for their garden. 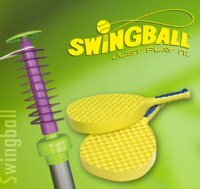 In Swingball, the tennis ball is attached to a cord which in turn is attached to a spiral at the top of a pole, and instead of a full size tennis racquet you play with a solid plastic bat. Players stand facing each other on opposite sides of the pole, and each is assigned a direction of travel for the ball, either clockwise or anti-clockwise around the pole. The players take it in turns to hit the ball, changing the direction of travel in the process. If you miss the ball as it goes by you can always try and hit it next time it comes round. Since the ball is attached using a loop threaded onto a spiral, missing the ball means the loop can move up or down the spiral. If it reaches either end of the spiral then the player who has managed to get the ball to reach their opponents end of the spiral gains a point. The version of Swingball I played as a child came as two metal poles. The bottom pole had a spike on the bottom and was hammered into the ground. The second pole slid into the first, and a rubber ring could be moved up and down to change the height of the game, so it was suitable for kids or adults to play. The second pole had a metal spiral on the top to which the ball was permanently attached, and a sprung loaded plastic top which had two lugs on the side. If the ball reached either of the lugs it would push the plastic top round, releasing it and shooting it up into the air to declare that a point had been scored. The bats that came with the game were quite weighty and made out of a solid black plastic. I remember having to grip the bats quite hard to stop them flying out of my hand as a child, but this meant that if the ball was travelling quite quickly when I hit it then I would feel quite a big impact reverberation up my arm. It looks like the only big change that has been made to Swingball is to now provide it with a sturdy base so you don’t have to annoy your parents by bashing holes in the lawn when hammering in the bottom pole. The Swingball range has been expanded however to incorporate various other games, including a football practice version where you kick a football attached to a string round and round, and a slightly gently junior version with a bigger, softer ball to hit. This entry is filed under Toys - Garden	and was posted on April 25th, 2008. You can follow any responses to this entry through the RSS 2.0 feed. You can leave a response, or trackback from your own site. The old Swingball was better than the new one. The metal spiral and plastic loop that attached to the ball string seemed to provide less friction to the ones of today.